Coastal zones and shallow marine habitats are among the most productive ecosystems on Earth. In many locations, they are subject to a variety of anthropogenic stressors, such as pollution and eutrophication (organic enrichment). Over the last 30 years, loss of seagrasses and mangroves associated with eutrophication phenomena has become a worldwide problem. 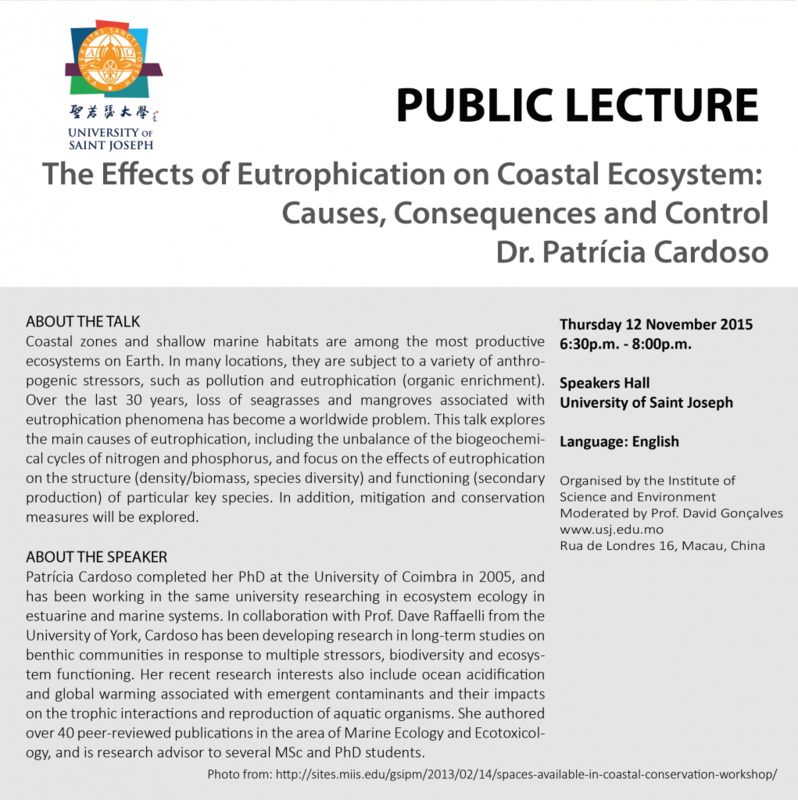 This talk explores the main causes of eutrophication, including the unbalance of the biogeochemical cycles of nitrogen and phosphorus, and focus on the effects of eutrophication on the structure (density/biomass, species diversity) and functioning (secondary production) of particular key species. In addition, mitigation and conservation measures will be explored. Patrícia Cardoso completed her PhD at the University of Coimbra in 2005, and has been working in the same university researching in ecosystem ecology in estuarine and marine systems. In collaboration with Prof. Dave Raffaelli from the University of York, Cardoso has been developing research in long-term studies on benthic communities in response to multiple stressors, biodiversity and ecosystem functioning. Her recent research interests also include ocean acidification and global warming associated with emergent contaminants and their impacts on the trophic interactions and reproduction of aquatic organisms. She authored over 40 peer-reviewed publications in the area of Marine Ecology and Ecotoxicology, and is research advisor to several MSc and PhD students.